The red band at the bottom of the cover shows Ralph Vernon-Hunt as Bond. 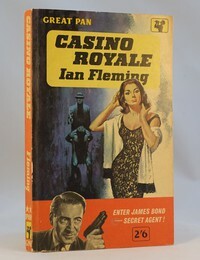 These editions are known as the “Directors"covers as Vernon-Hunt was the managing director of Pan books at the time. As well as being a model for Bond and MD of Pan books, Vernon-Hunt was a WW2 fighter ace. Casino Royale, Moonraker, Live and Let Die, Diamonds are Forever, From Russia with Love, Dr No and Goldfinger were all issued with different coloured bands showing Vernon-Hunt. Getting a complete set of these is not easy with Dr No perhaps the most difficult to find. Listed below are the different editions / variants we have found in our collections. If you have a copy with this artwork please check if your copy fits with the below - if its different please get in touch as even after all these years new variants are still being found.